Give the gift of glowing healthy skin with any of our Limited Edition Christmas Gift Beauty Packs. Each skin care set has been specially created to help YOU gift the perfect present and all beautifully packaged to make you appear even more special. All are priced to help your budget – and no one needs to know – shhhhhh!! Osmosis MD and Colour have created 3 yummy skincare gift sets for you: The Perfectly Protected kit comes with a gorgeous orange skin care carry bag. 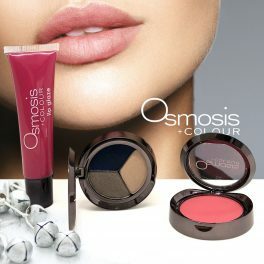 The Osmosis Colour Merry and Bright kit is for makeup lovers. It gives you a trio of eyeshadows, a blush, a lip glaze with a black makeup carry bag. The Osmosis Perfectly Polished kit is a beautiful way to give the gift of beautiful clean skin! As well as containing two of their very popular products it also has the amazing Sonic Brush and is all packaged in a stunning gift box!! Lastly, but not least for those of us who don’t appreciate their lines, there are the 4 Wrinkle Schminkles gift packs. Each one contains their nourishing Morning After Glow serum as well as specific wrinkle smoothing kits for sleeping in. For your man who hates his crows feet go the Ant-Bro kit. The On the Fly kit – all about the fine lines under the eyes, maybe your older sister?? The Upper Facelift kit – has she had “work” done or not??? Your stylish Auntie Sue?? The Chest and Neck kit – to smooth the giveaway ageing areas – maybe your mum?? And then for the others in your life why not check out our other Christmas Gift Guides – there’s a little something for everyone – and you!